Pearl, California may appear to be a cute, historic town, but it takes the Lifestyle reporter for the local newspaper to dig out the nasty truth behind the small town in Pat Browning's mystery, Absinthe of Malice. Penny Mackenzie actually has no plans to move on from her comfortable job at The Pearl Outsider. She's the Lifestyle reporter, while her best friend, Maxie Harper, is the more ambitious one. But, when they hide in a cotton field together one night, and watch a group of teens accidentally uncover a skeleton, it leads to tragedy. For a short time, Maxie stirred up some of the town's old history. However, on the night of a big town event, while Penny waited below in the historic jail turned bar and grille, Maxie died. Now, it's Penny's turn to track down the town's secrets, with the help of an old college boyfriend turned investigator. Pearl's secrets could lead back to the founding of the town, and the Klondike Gold Rush of the 1890s. Absinthe of Malice is a difficult traditional mystery to describe, without giving away too much of the plot. I'll just say, Penny Mackenzie is a welcome change from so many women in mysteries. Those of us who get tired of women who rush in by themselves, in the dark, when they know the murderer is out there, have a term for them - TSTL, Too Stupid To Live. Penny is a reluctant sleuth, who doesn't want to investigate friends, but wants justice for Maxie. However, she's not a stupid woman. Accidents happen, but Penny tries to protect herself. My kind of amateur sleuth! Put together a small town mystery, a terrific amateur sleuth, a little romance, and it's a highly recommended crime novel. Check out Pat Browning's Absinthe of Malice. Absinthe of Malice by Pat Browning. Krill Press, 2008. ISBN 9780982144312 (paperback), 244p. Great review,Lesa! So glad you liked Penny! Great character, Pat! Thank you for Penny. 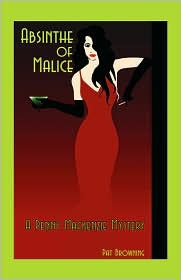 Lesa, you said Absinthe of Malice was a difficult mystery to describe, yet you did a terrific job of it. In fact, your description convinced me I would enjoy this book. Pat is a terric writer as well as a terrific person, so how could her book be anything less? Thank you, Earl. There was so much more I would have liked to have said, but restraint is better than giving away too much of the book or plot. I hope you do enjoy Absinthe of Malice! Thanks, Maria! I'm glad you took the time to comment on it, since you're so familiar with Pat's settings. I hear Hanford has changed a lot, but it's nice to remember the good ol' days. Hugs from here, and thank you for stopping by!